A VW Tiguan 2.0T made 2012 with only 1200 miles,the ower told technicians that passive keyless system can not work and engine will not start.Here i share this real case from diagnosis to solution.Hope you will get some useful info from this topic. #1 Passive Keyless Entry System unstuck. #2 Can not start engine. #3 The dash show the info it can not find the key,but engine can be started at emergency situation. 1 Disconnect the battery and wait for several minutes,then connect the bettery. 2 Program key with passive keyless entry function by bootstrap program. Technicians try both method,but the symptoms still exist. 1. The trouble can not be caused by battery failure,because engine can be started at emergency situation. 2. The trouble can not be caused by key fob failure,because the remote open the door correctly and probatility of both key failure. 3. Relevant connectors and wire harness work normally,otherwise the auto diagnostic device will read the trouble codes. Technicians found that the key indicator light flashed when pulling the door handle.It means that passive keyless system controler receive active signal from door handle,keyless controler sent the low-frequency signal to remote key by low-frequency antenna and acitve BCM. (BCM sent authentication to keyless controler and control TSG to unlock or lock doors) If BCM can not be active by Keyless system controler,whole vehicle networ system will be in sleep mode except BCM and Keyless controler. The engine can be started by emergency mode.When passive keyless entry system can not identify the authorized key,you can start the engine by emergency mode.Put the key near the coil and press the start button to start engine.At the emergency mode,the key will bypass the passive keyless entry system and comnunicate with immobilizer system directly. BCM failure is low.So it most likely that long encoding of BCM is incorrect. Technicians compare the long-encoding to other one from a same vehicle with same confinguration. Two sets of long-encoding are different,it can be determine that this trobule is caused by the long-encoding failure. 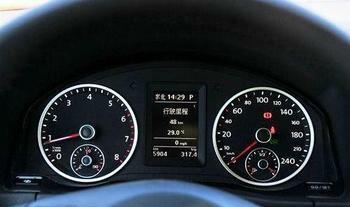 After rewriting the long-coding of BCM, the trouble disappeared.Technicians got the info that owner refit the car to update navigation system.The long-encoding failure caused by it.